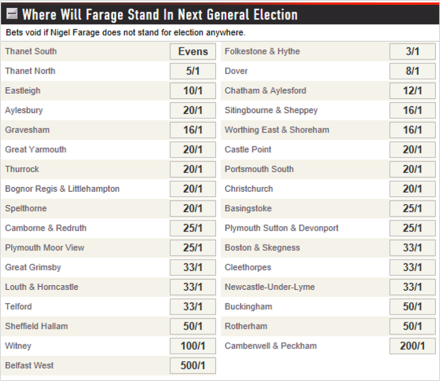 Ladbrokes have a market on which constituency Nigel Farage will stand in at the general election. When deciding not to stand in Newark, he cited the fact that he had no personal connection with the area. That should pretty much rule out everywhere outside of the South East. He dropped another hint last week; when asked if he would be standing in Essex he replied that it would be somewhere “south of the river”. I’m assuming that refers to the Thames, but perhaps he has cleverly given himself the wriggle room to claim the river in question was, in fact, The Humber. 45% of all the best we’ve taken on this market have been for Thanet South, and it was favourite from the start. Farage stood here in 2005, was born nearby and UKIP have polled very well in local elections in the area. If Farage goes for this seat, I expect UKIP would instantly go odds-on. The betting now implies that it’s pretty certain that wherever he chooses, it will be somewhere in Kent. UKIP’s local election results were actually fairly poor in Eastleigh, which had been talked up as a possibility after their close placed second in the Westminster by-election. *Ladbrokes have temporarily suspended betting on individual constituencies to give us a bit of time to re-assess after the locals/Euros/Ashcroft poll. Should be back up in a week or so. UPDATE: Is Clegg under threat? Probably not. In response to the speculation today, we’ve resurrected our market on whether Clegg will be LD leader at the general election and it’s 1/10 that he is. You can get 5/1 he is replaced before then. I guess this could get a bit of traction if they get zero seats and finish behind the Greens in the European vote.